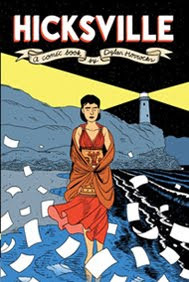 Thien and Rina have the huge honor of interviewing distinguished comic artist and writer, Dylan Horrocks, whose celebrated comics masterpiece, "Hicksville" has just been re-released with a beautiful new edition published by Drawn and Quarterly. In this episode, Dylan talks about his personal journey in comics-making since the first printing of "Hicksville", as well as his revealing experiences writing for mainstream comics, the decision to serialize his comics on the internet, and the inspiring comics scene in New Zealand. We also chat with our lovely New Comics reporter, cartoonist and buddy Josh Frankel about new work by Lewis Trondheim, Oliver East, Matt Dembicki, as well as McSweeney's Panorama. We are really happy about this episode, and hope you will be too -- have a listen! not liking JRJR comic art does not make lewis trondheim a jerk. Haha, I was wondering what grievous offense it was that he'd committed! Great show! Dylan Horrocks is super tubular. Is there a worse time to eat than when you're on the radio?? Nice interview. There were some great moments, both funny and profound. And now I know what happened to Atlas. Hey Buddy!!! It's THE COMIX CLAPTRAP!